Trust me, you need a bucket for your aquarium. Here’s why! Oh wow, buckets! How exciting, right? Don’t worry, I had the exact same thought when I was told to create a guide on aquarium buckets. It’s perhaps the most boring topic I can think of. So boring, in fact, that the humble bucket is often overlooked by beginners setting up their first aquarium. 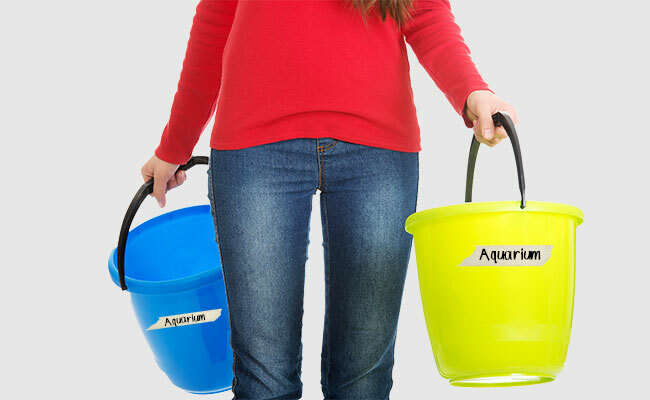 Today, I am going to show you why you need a bucket and how to choose the right one for your aquarium. Why do you need an aquarium bucket? 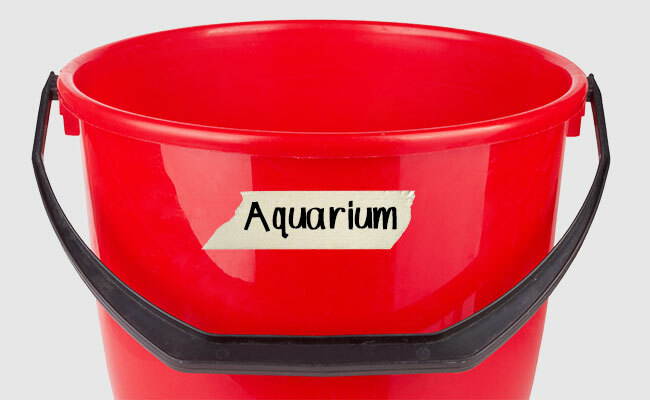 Which is the best bucket for your aquarium? What’s better than one bucket? Don’t think you’ll ever need a bucket for your tank? Think again! Below are four popular aquarium uses for buckets. 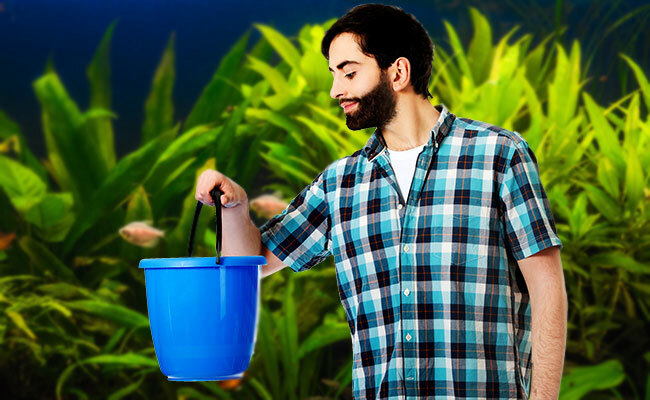 When water change time rolls around, you’ll be thankful you have a bucket on hand. This is the number one use for my bucket. Once I have finished feeding my corals, I place my gloves, coral feeder and anything else that is dripping wet in my bucket until I have a chance to dry them. It sure beats dripping water all over my counter and floor. In fact, I pretty much keep all my most commonly used aquarium equipment in a bucket inside my aquarium stand. If you have a sick or injured fish, and your hospital tank is in another room, a bucket can be used to transport your fish from one tank to the other. If you place wood inside your tank, it will release tannins – making your fish tank look like tea. Soaking your driftwood before placing it in your aquarium is a great way to remove the tannins. You know what makes a great driftwood soaker? That’s right, your bucket! Whenever you need an oversized container, a bucket is there for you. Trust me, it will be used more often than you think. Your bucket should only be used for your aquarium and nothing else. Last week, James, a member of my local aquarium club, told the tale of how he accidentally killed his first fish with a bucket. Well, it wasn’t just the bucket. You see, when James performed his water change, he used the same bucket that he filled with soapy water to wash his car. While James couldn’t see it, there was a soapy residue left at the bottom of the bucket. And when he used the bucket for his water change, the leftover soap was added to his aquarium. It wasn’t much, but this leftover soap was all it took to kill the beneficial bacteria in his tank, which lead to an ammonia spike that killed his fish. Don’t make the same mistake. Never use your bucket for anything but your aquarium! I’ll be the first to admit that I love to do detailed reviews of products. If you are new to FishLab.com, check out my detailed automatic fish feeder review, and you’ll see what I mean. But for this article, I felt that was unnecessary. I mean, it’s a bucket. If it holds water, then it’s functioning as intended. Even the cheap buckets that you pick up from your local Walmart for a couple of dollars work well enough. Capacity – How much water it can hold! Let’s say that you remove three gallons of water each time you change the water in your aquarium. Well, a two-gallon bucket is going to be too small. I mean, who wants to make two trips? Not me. Similarly, a three-gallon bucket is going to be too small too. Sure, you can fill it to the brim, but the moment you carry it through your house, you are going to spill it everywhere. Wet socks and wet carpet? No, thank you! It is for this reason that I suggest buying a bucket that holds at least one gallon more than you need. If you want a bucket to hold three gallons of water, buy a four-gallon bucket. This way, you’ll be able to carry your bucket through your home without making a mess. Typically a five-gallon bucket will be good for aquariums up to 29 gallons. Incidentally, a five-gallon bucket is the limit of what I recommend. When full, it weighs close to 41 pounds. Could you confidently carry that through your house without spilling a drop? I couldn’t. For tanks that are larger than 29 gallons, using a bucket for water changes isn’t practical and will require multiple trips. You would be better served by using a water changer, essentially a giant gravel vac that runs from your sink to your tank. That’s not to say that larger tanks don’t need a bucket, because they do… Just not for water changes. Important: The bucket you use with your aquarium should be purchased brand new. You never know what chemicals have been used in a second-hand bucket. Why risk adding them to your tank? Once you find the perfect bucket for your aquarium, I highly recommend buying a second one. Doing so makes changing the water in your aquarium a much simpler task. 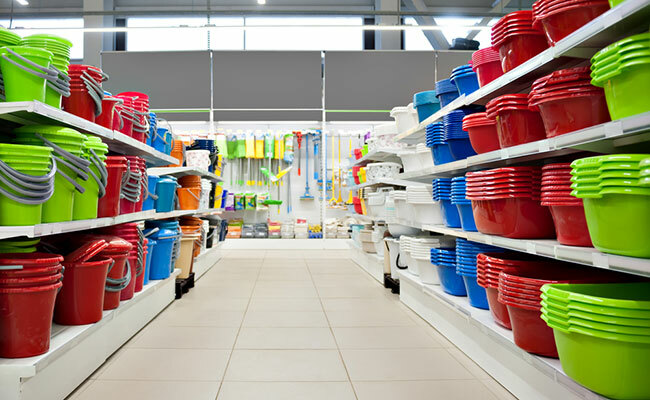 With two buckets side by side, you can easily match the amount of water taken out with the bucket of water replacing it just by eyesight – refill the perfect amount each and every time. As an added bonus, a second bucket allows you to multitask. Treat your water with water conditioner or add your salt mix in one bucket while your tank is draining into the other. And finally, buckets break. Don’t get me wrong, a properly cared for bucket will last years and years. 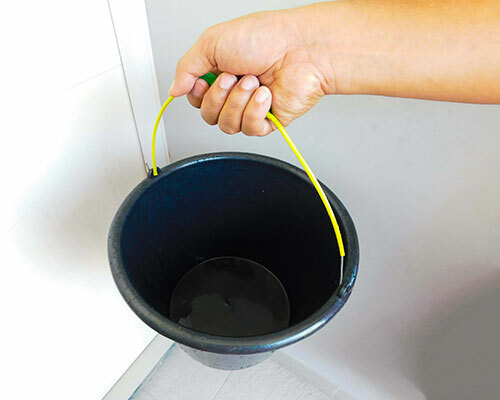 But nothing lasts forever, and if your bucket breaks in the middle of a water change, you’ll have a spare ready to take over – beats rushing out to the store to buy a new one! Your brand new bucket might look clean and ready for action, but I’ll bet that it isn’t. In fact, it’s likely coated in all sorts of nasty stuff including dust from sitting on the store shelf or oils and other gunk that is left over from the manufacturing process. Not exactly something you want in your aquarium, right? Fortunately, you can remove this unwanted gunk with next to no effort. 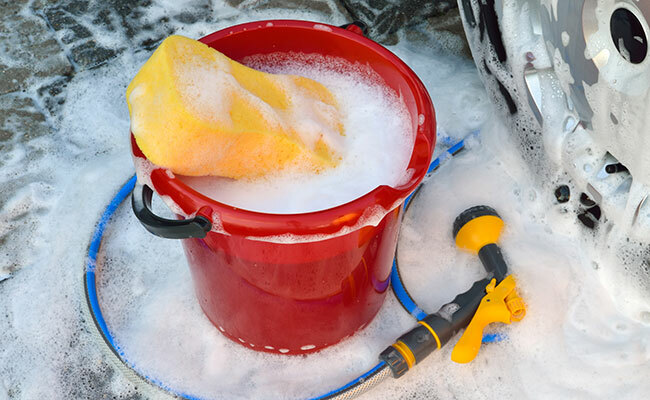 Simply give the bucket a quick scrub with mild dish soap. To avoid making a mess, I do this in the shower – that way I can easily rinse it off when I’m finished. Keep rinsing the bucket until the soap smell is gone and then some. You can never rinse it too much. Finally, fill the bucket with tap water and add your dechlorinator or water conditioner of choice. This removes any chlorine/chloramine leftover from the tap water. Alternatively, rinse with deionized water. Tip the bucket out, and let it to air dry. Your brand new bucket is now ready for use. I make sure I label mine “Aquarium Use Only” because it stops my family members from stealing it. You can never go wrong with a bucket on hand. Whether you just use it for storage or for hauling water through your home, you will always find a use for a bucket. Don’t make the same mistake as other beginners and skip over it. It may not be as exciting as other aquarium equipment, but you’ll thank me when you need it! How do you use your aquarium bucket? Let me know in the comments below! Hi Ian, brand new tank owner here. My daughter and I just came across your blog and are reading basically everything and learning a lot. One thing you’ve mentioned a few times is washing your hands before putting them in the water, or washing tools like the bucket prior to use. I’ve heard that you should never use any kind of soap on your tools, and you should only scrub your hands with water thoroughly prior to putting them in the water. Can you comment on this? Is it okay to use certain types of soap? Or is it rinsing thoroughly that makes it okay? The answer you get here will entirely depend on who you speak too. Some people skip washing altogether, others use a mild, unscented soap. Because some people have oilier skin than other, absent mindedly touch greasy or dirty objects or use lotion, I always recommend people use soap. In my opinion, it’s less the soap that matters and more about how thoroughly you rinse. Anecdotally, My wife has been buying many different brands, types and scents of hand soap over the years I have been keeping fish. While I prefer unscented, I don’t have much say in the matter. I have my hands in a tank at least once a day and have never stopped to examine what soap has been purchased. If my hand is going commando, I wash as high up my arm as I will reach in. I vigorously rinse with warm water (if you think there is still soap on there, keep rinsing) You can never rinse too much. Perhaps more important is washing your hands after. Your aquarium is a bacteria pit. Oh, and never stick your hands in your tank if you have a cut, scratch or graze. I bought two buckets from Lowes (they were the cheapist), then I noticed a flaw. When I drip acclimate my fish, it’s difficult to see them in a dark blue bucket without a light Solved it by finding a white bucket at my local hardware store. That’s a very interesting point. Thanks for sharing, I hope your experience helps out other readers! I just stumbled cross your blogs, and I am enjoying reading your reviews and suggestions. I have two things to suggest. First, you can use more than one bucket for draining water from your tank. I use two 5 gallon pickle buckets that I got from a deli to do water changes in 55, 38, and 29 gallon tanks at work, and a 38 gallon at home. Drain water until one bucket is about 2/3 full, put your finger over the end of the hose, and transfer it to the other bucket. Thanks for sharing your amazing advice. I really like the use of more than one bucket, it makes the emptying process seamless, especially for multiple tanks that would otherwise be too small to use a water changer system with. As for your idea of using a watering can – genius. Especially for smaller tanks! The nozzle will ensure that water is returned to the tank gently too. I’m definitely going to share this with anyone who will listen.